Two prominent American-Islamist political activists, both avowed opponents of Israel's existence, renewed complaints Monday that the recent controversy involving U.S. Rep. Ilhan Omar's series of anti-Semitic statements was unjust. At a news conference at the Dar al-Hijrah mosque in northern Virginia, Osama Abuirshaid, who previously worked for a Hamas-support network in America and leads one of the country's most prominent organizations pushing for an economic, social, academic and political boycott of Israel, called it "an orchestrated controversy." Nihad Awad, who also was part of a Hamas-support network in the United States and has been the Council on American-Islamic Relations (CAIR)'s only executive director, echoed Omar when he repeated a demonstrably false trope that "the debate [about Israel] that has been prohibited. The influence of the pro-Israel forces on our government officials' decisions, vis-à-vis aid to the State of Israel." It's part of broader effort to dismiss any criticism of Omar's statements as its own form of bigotry. Omar, D-Minn., first drew attention regarding anti-Semitism during last summer's congressional primary campaign. A 2012 Twitter post she wrote during a conflict between Israel and Hamas in Gaza said that Israel had "hypnotized the world," and she prayed that "Allah awaken the people and help them see the evil doings of Israel." She apologized in January for trying to rationalize her invocation centuries-old smears alleging Jews' ability to control the world, saying "It's now apparent to me that I spent lots of energy putting my 2012 tweet in context and little energy is disavowing the anti-semitic trope I unknowingly used, which is unfortunate and offensive." Just two weeks later, after she again took to Twitter to invoke an anti-Semitic stereotype – this time about Jewish money and power. "It's all about the Benjamins baby," she wrote to explain why she and fellow Democrat and Israel-basher Rashida Tlaib draw attention for their "criticisms of Israel." Asked who she was referring to, Omar wrote, "AIPAC! ", referring to the American Israel Public Affairs Committee. Under pressure from House Democrats, Omar again apologized, again saying she was "listening and learning" and never meant "to offend my constituents or Jewish Americans as a whole." She stayed silent, however, as Islamist supporters used the controversy to raise money for Omar's re-election. Omar then struck again, claiming that, as a member of Congress, she is pressured "to have allegiance/pledge support to a foreign country," which invoked another centuries-old smear of Jews – that their faith or support for Israel constitutes a dual loyalty. It is a common refrain among Israel bashers. That didn't stop people from claiming Omar was treated unfairly. "Because she was a hijab-wearing Muslim, who was critical of Israel, the GOP sought to exploit her in their continuing effort to drive a wedge between the Jewish community and Democrats," American Arab Institute President James Zogby wrote. "For their part, some Democrats reacted with hyperventilated outrage. Extreme language was used to denounce Omar. Her words were described as 'bigoted', 'vile', and, of course, 'antisemitic slurs.'" "What she did do was challenge official American, and in particular, congressional silence on the suffering of the Palestinians, the efforts by pro-Israel groups to silence debate on this issue, and the virtual identity that pro-Israel groups have established between being pro-Israel with American interests." he wrote. "So now this could be again used as another accusation against our community of being anti-Semitic just because we dared to speak against the Israeli policies," Abuirshaid said. "This has nothing to do with Jews." Remi Kanazi, a poet and member of the U.S. Campaign for the Academic and Cultural Boycott of Israel's organizing committee, insisted "Omar said nothing wrong," and claimed a critic was a racist triggered by "a Black Muslim woman speaking up." 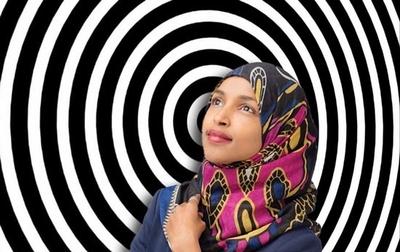 "Reading the many progressive identity-based defenses of Omar, which repeatedly and pointlessly invoke the fact that she is a hijabi-wearing black refugee being criticized by a white native-born American woman, one gets the impression that this particular legislator can pretty much say whatever she wants and expect to be absolved for it: Her canonization as a left-wing hero is necessary, and irrevocable." Tlaib, D-Mich., appeared on CNN's "State of the Union" Sunday to discuss the terrorist attack that killed 50 Muslims inside two New Zealand mosques last week. Anchor Jake Tapper asked why she recently said that "I think Islamophobia is very much among the Democratic Party, as well as the Republican Party." Anti-Muslim bias is "part of" the reaction, even among Democrats, to Omar's repeated controversies, she told Tapper. "Is it because she's a black Muslimah? Is it because it's around the issue of human rights violations from the country of Israel? I don't know," Tlaib said. Other people say bad things but don't generate the same attention, she said. It's no coincidence that many of the people making these arguments oppose not only Israeli policies, but the nation's very existence. Abuirshaid, for instance, blamed Israel for the Syrian civil war and for the Egyptian military's 2013 ouster of a Muslim Brotherhood-dominated government. "Israel, he told the 2016 Muslim American Society/Islamic Circle of North America convention, "is a direct challenge to the entire region. Israel is risking the entire region ... remember that Israel was not created just to take and to swallow Palestine. It was created to divide and to weaken that part of the world." 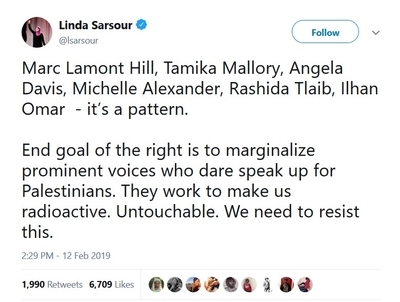 Linda Sarsour, who has never apologized for blaming Jews for police shootings of unarmed black people in America and who blamed "Jewish media" for giving her a bad reputation, says Omar is just one of a series of activists being shut down over nothing. Sarsour is open about her support for a "one state solution" to the Israeli-Palestinian conflict. It means the elimination of Israel. One state advocates cling to a fantasy that an existing nation of 8.5 million people will voluntarily dissolve itself to accept minority status in a greater, Muslim-majority Palestine. Or, they want a global pressure campaign that can break its will. It's what Marc Lamont Hill means when he speaks of a Palestine "from the river to the sea." As we recently pointed out, CNN did not fire Hill for criticizing Israeli policies during a United Nations speech. He did that for 20 minutes in comments that drew almost no attention. It was only his conclusion, wishing for a "free Palestine from the river to the sea," that controversy ensued. But Hill, speaking to the Islamophobia Studies Center dinner Sunday in California, said there needs to be "a coalition [put] together to protect people who are willing to speak the truth like Ilhan Omar. It cannot be a crime to say that there is a lobby that defends the interests of Israel." He would have a point if that's what Omar said. 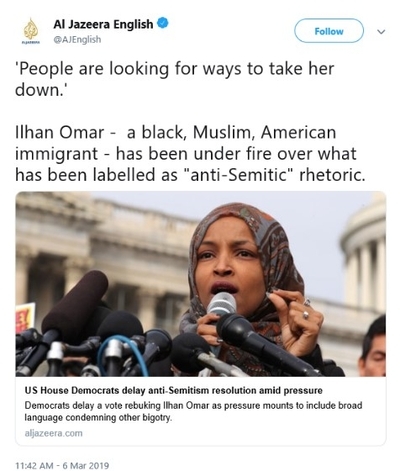 But "all about the Benjamins, baby" is a clear statement about money and power, in the hands of Jews, which in Omar's mind exerts control over American policy. It's anti-Semitic when said by a black, Somali Muslim woman, or when said by a white American male conspiracy nut who makes no effort to hide his Jew hatred. In a damage-control exercise, Omar wrote an op-ed for the Washington Post insisting she supports a two-state solution. Yet in that same op-ed, she singularly blamed Israel for the violent repression of the Palestinians as the root cause of the conflict. There was no mention of Hamas terrorism or previous initiatives that Israel accepted, but Palestinians rejected, which would have created a Palestinian state. Omar also told voters during her primary campaign that she opposed the anti-Semitic boycott BDS movement targeting Israel because it was an obstacle to a two-state solution, only to reverse course after the election, and support it. It's clear that people will continue to protect her no matter what Omar says. There are ways to criticize Israel without being anti-Semitic. Omar, an elected member of Congress, hasn't figured that out yet. Acknowledging that has nothing to do with how she practices her faith, the color of her skin, her gender or where she comes from.